I have been working on my Kaley Yard layout since 2011. The layout is on two shelves in an enlarged and modified garage - the top shelf is California themed, the lower shelf will be Florida themed. A helix links the two levels and trackwork is complete so that trains can be operated. Scenic work has been completed on about half of the California themed shelf. My next step is to create a "scene" in the left hand corner of the top shelf. This scene needs a device to disguise the tight radius curves in this area. The layout has been created to replicate images from my rail focussed visits to the USA and the image that came to mind for this scene is Indio on the Sunset Route in Southern California. I first visited Indio in the summer of 2005 while exploring the Sunset Route South East from Colton Yard through San Timeteo Canyon, Palm Springs and the Desert Cities. Indio was originally just barren desert, its development came about when it was determined as the halfway point for the Southern Pacific Railroad between Yuma, Arizona and Los Angeles, California. Steam engines needed to be re-filled with water and the city evolved from this need. The city's first permanent building was a craftsman style Southern Pacific Depot station and hotel used by staff who serviced locomotives and was somewhere for crew to bunk down before their next shift. Southern Pacific tried to make life as comfortable as it could for their workers. They wanted to keep them from leaving such a difficult area to live in! Indio was still a reasonably busy railroad city into the 1970s where helpers were added to west bound trains for the climb of Beaumont Hill. Indio still had helpers in 2005, but during my last visit in 2012 all the trains I saw had DPUs. 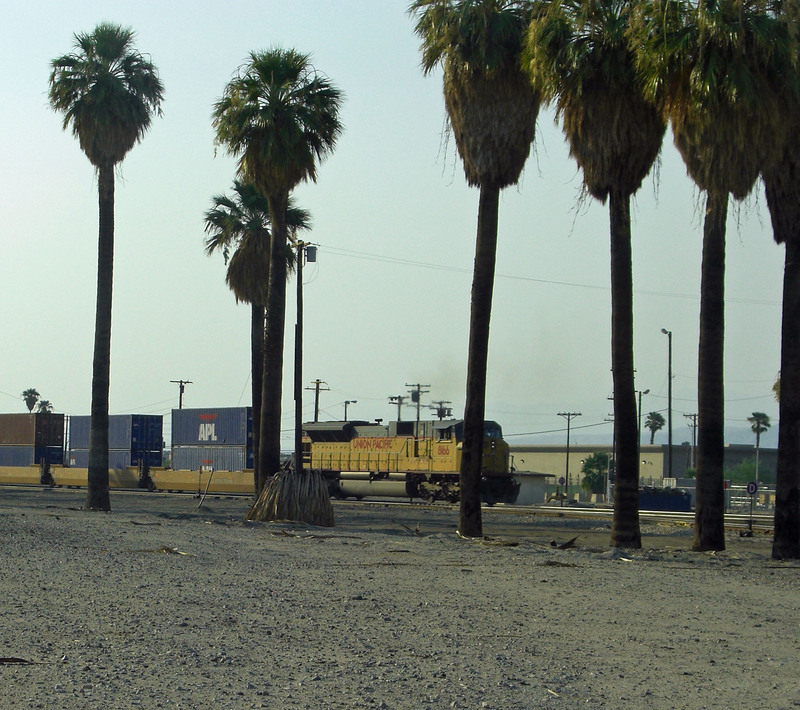 The area around the tracks is very open and accessible and there are many well established palm trees that give the city's railroad a distinctive atmosphere. A representation of this area was something I wanted to include in the Kaley Yard layout. 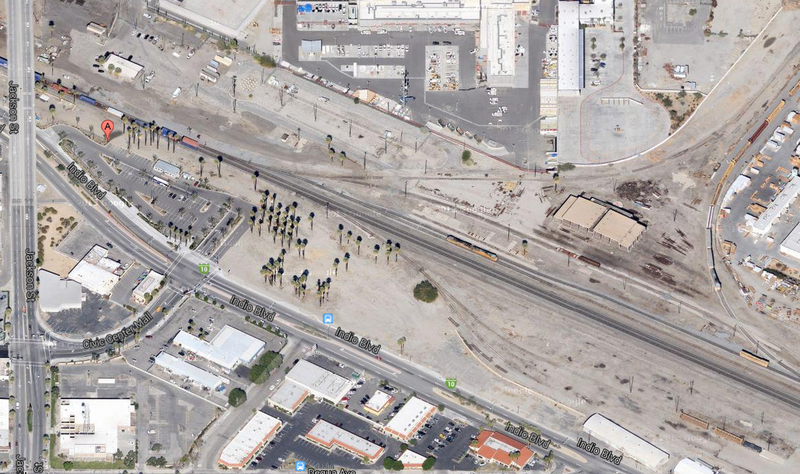 This Google Map screen shot shows the Sunset Route through Indio with the wye for turning steam locomotives still visible as well as the remains of a locomotive facility. The distinctive palm trees are just left of centre. DPU power at the rear of a twin stack heading for Long Beach. I wanted to use a representation of Indio to link a Palm Springs scene to the industrial area to be modelled in the centre of a turnback loop. 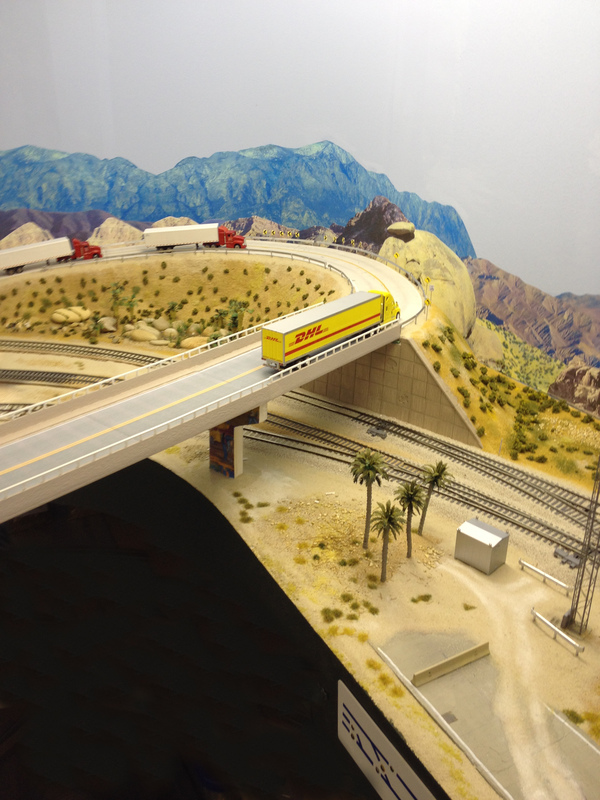 I wanted a bridge to be a scenic element to help disguise the tight radius curves on the approach to the turnback loop. The bridge will continue over the industrial area in the middle of the turn back loop and will cross a flood channel I want to include in this area. I thought I should make the bridge a signature structure and having used LED lighting strips on our Roundtrees Sidings Exhibition Layout (http://roundtreessidings.wordpress.com/,) I thought I would include them on Kaley Yard. In addition, I wanted the support piers to be representations of those seen in Chicano Park in San Diego. On my travels to Las Vegas on I15 I had seen public art on new roads being built and I also noticed the safety cages - something else to include in the scene. In addition, I wanted the flood channels to be representations of those with the graffiti art that adorn many areas of Los Angeles. 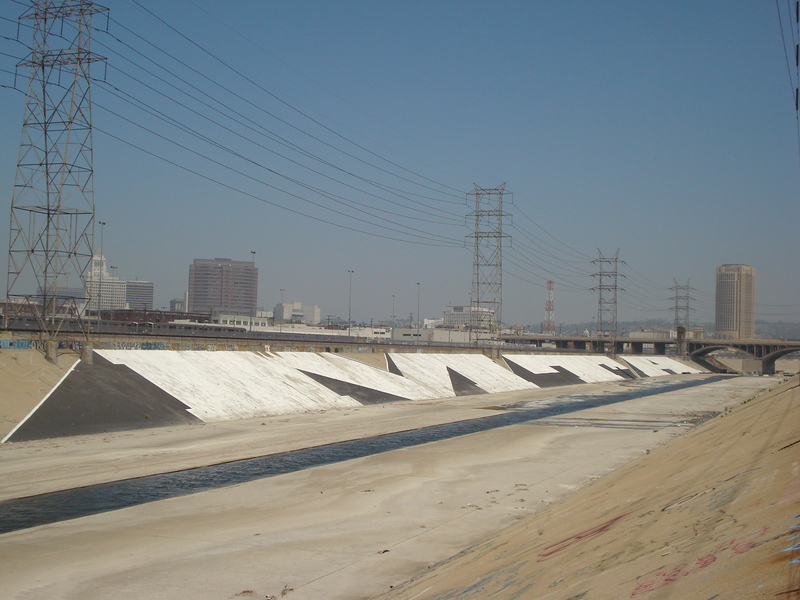 . . . . . . . . not so much this image from the Los Angeles River near Redondo Junction . . . . . .
. . . . more like these from the small feeder channels. Having spent time researching what I wanted to do and creating an image in my minds eye, I now needed to make my concept a reality. To determine the size, shape, angle and nature of the bridge forming the centre of the scene, I needed a mock up. The first thing I did was photograph one of my plans and then use a basic paint programme to postition the Los Angeles flood channels I wanted to include in this scene. The positioning of the bridge and its angle in relation to the tracks was determined by the bridge piers and their relative position to the flood channels. With the flood channels marked on the baseboard I could then mock up the bridge and the piers. 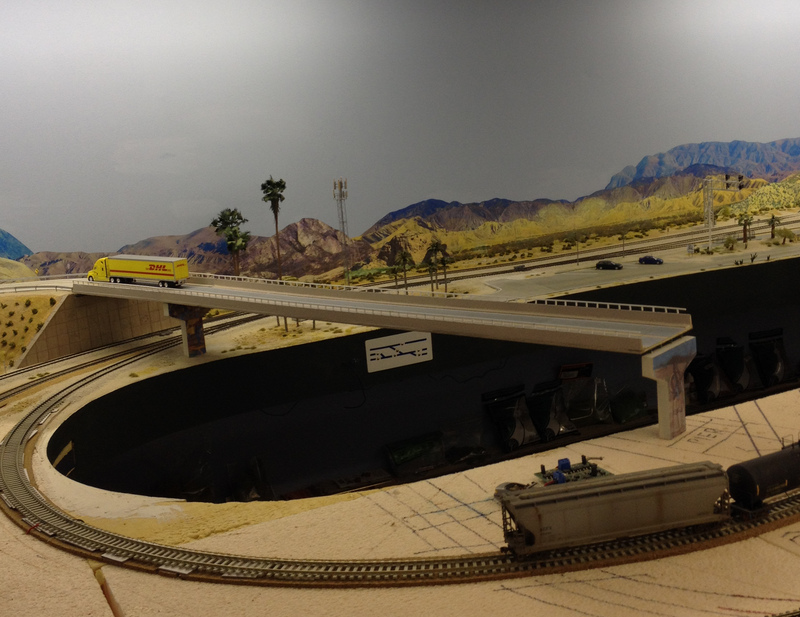 Once I knew the position of the bridge, I could then plan and measure the curved embankment for the road that will fill this corner of the layout and will create an impression of Indio. The bridge abutment will be modelled on a modern concrete casting technique with images, similar to this seen on the approach to Los Angeles Union Station. I have used this imagery on retaining walls on my old Taft Yard layout. With the planning done that translated the image in my minds eye to the baseboards, I could then start to develop the scene. Step one was to draw the road on the layout, using HO road vehicles to judge the road radius. The grey painted road is one of my failed ideas. I wanted a road to cross the tracks here and then form a T Junction with the embankment approach to the bridge. However, the steel rods supporting the shelf pass directly under the road in this location and there is nowhere to secure the operating gates and their tortoise point motors. The next stage is to cut foam to create an embankment. The foam is cut larger than is needed and the cut lines are marked on with a red felt tip pen. A model railway club member worked as a construction engineer before retirement and told me that a constructed embankment like this should have sides with a maximum angle of 60 degrees - 45 degrees was his suggestion. The bottom of the embankment will link in with the desert scenery opposite the Palm Springs scene and the area to the right of the bridge pier will be a representation of the open area with the palm trees in the City of Indio. With the foam embankment roughed to shape, the 45 degree angle needed to be shaped. This "JETCUT" saw has a 45 degree bevel on the handle base and this was used to create a line of cuts a few millimetres apart. The small sections were then broken off to create the angle of the embankment that could be filed to a smoother profile. Bamboo skewers were pushed into the underneath surface, plenty of PVA glue spread on the baseboard surface and then each foam piece was pushed into place. Two vehicles were added to check that the structure looked OK - a couple of sections needed some filing and when I was happy with the result, weights were added to keep everything in place while the glue dried. The next step was to make the bridge abutment. Plasticard was cut to an approximate size and shape to act as a base. An A4 sheet of embossed plasticard, (N scale ribbed container siding,) was cut into 2cm x 2cm squares. Google images provided the source for suitable silhouettes to create the visual images on 6 of these panels. These were drawn on the panels and then cut out with a sharp knife. The square panels were then carefully glued to the base sheet of plasticard. The completed bridge abutment in place. The cut out on the top edge is to provide the space for the I beam girders and bridge decking. The wall has been brush painted with aged concrete acrylic paint. The twin-stack has been used to determine height and clearance. Great progress, thanks for Sharing! The next step is to make the road. I have used the Woodlands Scenics "Pave-it" system in the past but with not too much success. The tape did not always stick and the pave it plaster would not "flow" and create a smooth surface within the tape edges. I found "Pave-it" difficult to source here in the North East of England and it was expensive. My last road constructed used casting plaster and foam tape, (bought at a hobby shop while my wife was buying scrap-booking supplies.) This worked much better for me, so I tried to do the same with this embankment. Failure - the foam tape which stuck well to the pink foam on a flat straight surface would not stick to the finer cream foam on a curve. My solution was to create the road edge from thin plasticard held in place with small pins. A line of pins were placed along the marker pen lines, the card edging put in place and then held by a second line of pins. The plaster was mixed in small batches to the consistency of thick milk and then poured and then the foam around the pouring was tapped with a spoon so that the plaster settled to a level. This was then allowed to dry. While the road was drying, the piers for the bridge were made. Their size was determined from my own photographs and cut from balsa with a sharp knife. 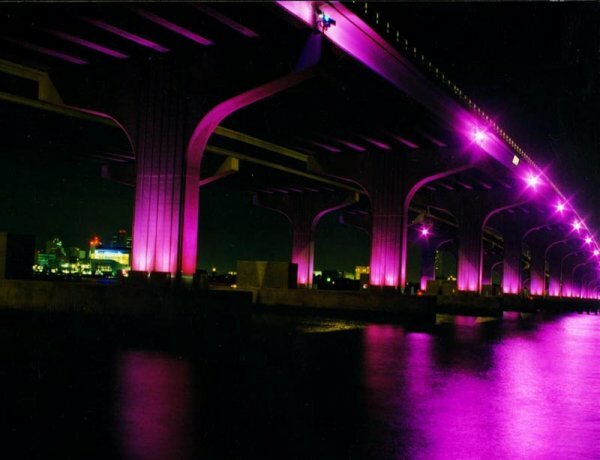 The images for the piers were sourced from my own collection supplemented by images sourced through Google. The images were manipulated in Gimp - open source graphic software. Care was taken to make sure the images were manipulated with regard to size and perspective - very few of the photographs were taken straight on to the piers. the images were printed on thicker paper than the normal cheap paper I use in my printer. This is the art work for one of the piers. The original image has been resized, the bottom part of the pier has a couple of figures airbrushed out and the perspective tool has been used to make the pier top horizontal and the pier itself vertical. My modelling has to fit in with family life and sometimes it has to take second, third or more likely 21st place on my “to do” list! •	Sanding, undercoating and painting every room in my son’s new flat – and then hiring, loading and unloading (5 times!) the transit van for the actual move. •	Helping my wife when she embarked on her new project – a garden pond. I expect all modellers have to work around domestic issues, this month I seem to have had more than my fair share and this halted progress for a full 5 weeks. In addition, I like to develop my layout as a series of mini projects and there are elements of each project that need to be completed before moving on to the next stage. I find this sometimes interrupts the flow of a project. I tend to work from back to front on a project so that I don’t have to lean over existing scenery to work on something at the back. I also like to have all the electrics in place and working before starting any scenery work and I like to complete track ballasting before working on the surrounding scenery. In this “structure” project, I built the foam embankment first so that the messy elements could be completed and the layout hoovered to remove foam dust. The next element was to wire the point motors and check they worked. This required the small mimic control panel to be made. Before the mimic panel could be wired, the facia needed to be in place. The area at the rear of the layout near the back wall needed the scenic treatment before the track was ballasted – and the track needed ballasting under the bridge because to ballast with the bridge in place would be more difficult than it need to be.A total of seven weeks passed before I completed the bridge piers!!!! Back to the project . . . . . . . . The surface of the piers were given a thin coat of PVA to seal them and then the images were glued to the piers with a Pritt Stick. The finished abutment wall was glued to the end of the embankment with PVA. The embankment was brushed with PVA and then sand was sprinkled on to create the scenery base. The road was painted with a light grey emulsion paint and the road edge markings added with a grout pen. However, when I looked at the layout with a wider perspective I became dissatisfied with the palm trees. They were the wrong variety for the area and with three different variety of tree from three different manufacturers in the scene it did not look right. The palm trees from around the oasis have been removed while I explore other options. I scratch-built my own palm trees from etched brass fronds manufactured byhttp://www.scalelink.co.uk/acatalog/Etc ... coupe.html. The road was detailed with etched brass manhole covers and centre line "no overtaking" markings made from thin paper masking tape. This was painted with yellow acrylic paint. The cracks were drawn with a sharp HB pencil. Weathering was created by drawing a thin pencil line with a 4B pencil and then rubbing with a finger. The crash barriers are Rix Products. The road vehicles are detailed toys. They are slightly under scale to create an impression of distance. This is the area between the Palm Springs scene and the Indio scene. The Palm Trees from the "oasis" have been re-used. The ground cover is a mixture of sand, fine buff ballast, talus, home made grass tufts and some chopped up hair. With electrics completed, track ballasted and the scenics in place at the rear of the baseboards, I can now start the bridge itself. Thin plywood is the foundation. Well . . . . .
seems I have run out of time! I have spent a lot of time preparing the infrastructure for the bridge and all I have to show for the competition is a piece of plywood. At least the plywood is cut to a very accurate shape, has been beautifully sandpapered, and the wood grain looks good. Pity it looks nothing like a bridge!!!!!!! With ModelRail Scotland out of the way, my wife's pond dug out and filled with water, I should have a clear weeks modelling. Progress reports can be found here. The bridge has finally been completed! I have also re-organised my wordpress site so that each "project" has its own page, making it easier to navigate.